Somewhere, amidst all the other detritus I’ve gathered, I have this angry pin. It was made the year after Those Who Make Gen Con (TM) chose to take historical miniatures gaming and place it in a dark basement (I neither jest nor exaggerate) of the Milwaukee Auditorium. It reads simply: “I found the miniatures games at Gen Con”. Gen Con left my hometown for the center of Indiana over a decade ago, and historical gaming of all kinds has fared little better since. Cards and clicks may have been replaced by cards, anime, and cosplay, but it still takes a dedicated grog to find something appropriate to his or her tastes. 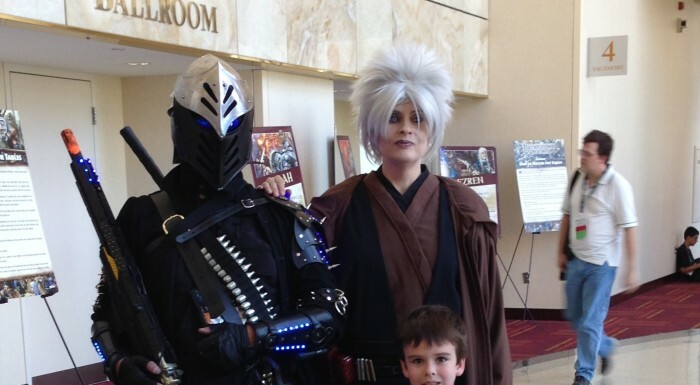 And Gen Con this year took real patience. It’s fairly well known that the hotel block reserved by convention organizers was significantly increased this year but still sold out in less than an hour. The on-line “wishlist” event registration system resulted in large queues and, at least anecdotally, gamers not getting into their first, second, or third choices. The exhibit hall was expanded yet again and yet, according to the folks to whom I spoke, sold out in near record time. I’ve long made it my habit to hit the convention hard Wednesday through Friday in the hope of avoiding the worst of the crush of humanity that arrives on Saturday. This year the crowds came on Wednesday night and never seemed to let up. In all this, though, there were those flying the wargaming colors and I write this to honor them. On the show floor, Ares Games’ big release was evidently its Battle of the Five Armies. At the very least it was the game company reps brought huge piles of and the only one on which they weren’t offering a very nice discount . Designed by the same folks that did War of the Rings, it’s a two-player, area-movement game of the eponymous battle. The most interesting thing, at least to me, was that the board has a much smaller footprint than its predecessor decreasing the density of the playing pieces. The game also has a strong emphasis on the role of the characters involved in the battle and brings both cards and chrome-y rules to serve that end. 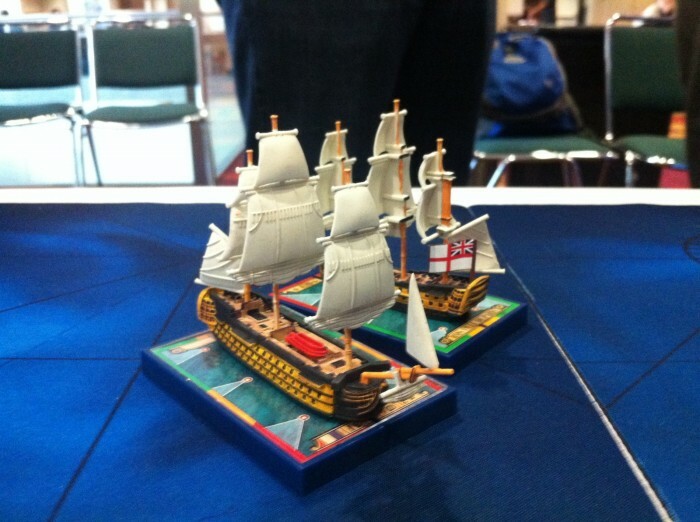 Ares also ran one of the earlier large-scale events at Gen Con in its “Sails of Glory Record-Breaker”. Based on how quickly the stock on the company’s booth was depleted, Sails of Glory is doing well and the record-breaker brought in 53 participants including my son whose nautical record now stands at one enemy sunk. The record-breaker also turned out to be a good deal financially as, for the $8 cost of admission, you received a complimentary ship of the line as well as a chance to win booth coupons. “Sails” is currently offering its second wave of ships and, I was told, the HMS Victory — promised as part of the original KickStarter for the game — will be out in January 2015. Nigh-legendary wargaming company — and friend of the Grogheads — Columbia Games was present with both Tom and Grant Dagleish there to talk Victory in Europe, Napoleon, 4th ed., and all other things block wargaming. I hope they won’t mind me saying that the convention specials they offer make it well worth coming out to see them. For my own part, I finally broke down and picked up the Eurofront 2 bundle and am making plans to play it non-stop during a future Origins with the Grogheads crew. 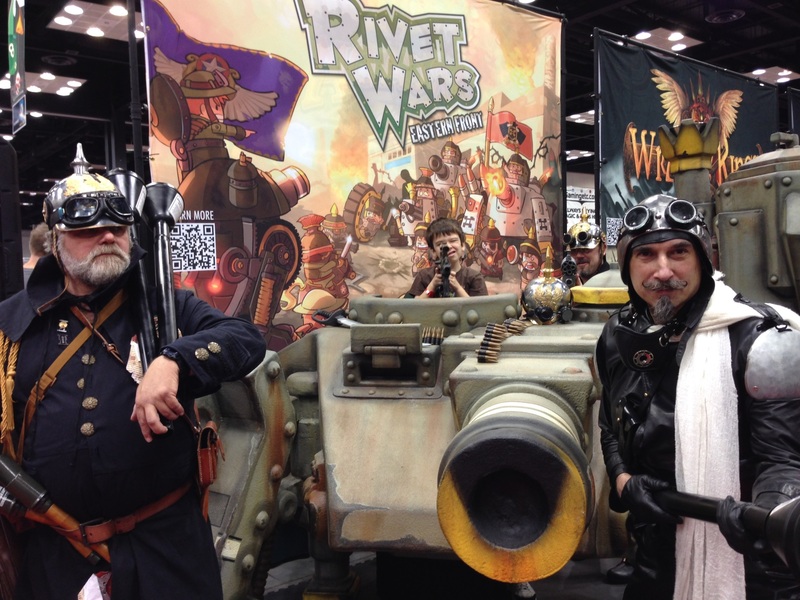 Fresh off a successful KickStarter and its Gen Con debut last year was Rivet Wars. Borrowing heavily from the look and feel of World War I, at least seen through a certain lens, this truly lovely miniatures game has you launching soldiers that seem to have been carved out of rivets — hence the title — against one another. 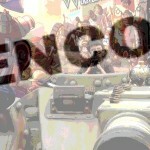 There’s also an array of tanks and other vehicles that are consistently well sculpted. If you’re looking to describe the aesthetic, it’s got a little bit of steampunk, a little bit of actual World War I, a little bit of Warhammer 40k/Warmachine customization, and a little bit of chibi cuteness all sort of blended together. The rules are not complicated and are well done. The game — as witnessed previously at Origins — also scales up well to larger engagements. I would also be remiss if I didn’t mention that the folks from Rivet Wars — in association with Cool Mini Or Not (I can’t bear to run its name together as I know they do) — put together what was to me the coolest floor display at the show. It featured a full-size model of one of the Rivet Wars tanks that visitors could stand in and have their pictures taken with ersatz Prussian soldiers clinging to panzerfausts. What’s not to love in that? 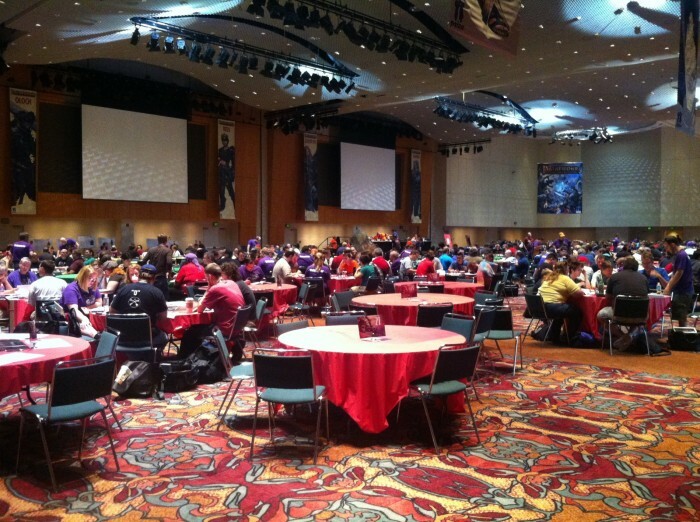 Days of Wonder was swamped each morning by those in search of its new game Five Tribes. I, however, wanted another look at the “D-Day Landings” expansion for Memoir ’44. When I approached Richard Borg about this monster at Historicon in July, I told him I felt he was trying to prove something with it, but couldn’t quite say what. He only nodded and laughed. For those unfamiliar, “D-Day Landings” is a series of maps done in the series’ “Breakthrough” style. These are much deeper maps — all but requiring a different deck of command cards — that allow a good deal more maneuver than the typical “Memoir” board. The six maps can be played individually or linked together to play the whole of the Normandy landing. There is, however, a catch: I haven’t done the math in detail, but my rough estimate is that playing all six maps requires no less than eight copies of the base game as well as multiple copies of the Equipment Pack (a new-ish release), the Winter War expansion, and others. Mr. Borg acknowledges as much in the booklet that comes with “D-Day Landings” (of course I bought it) when he writes that not every club or individual will have resources to put on the whole of Operation Neptune. But, when you see it all laid out, it’s remarkable. The unsung heroes of the show floor for wargamers are the handful of companies that sell “ding-and-dent”, remaindered, or used games. The biggest of these for the past couple years has been Coolstuff, Inc. I found it difficult to be away from it for more than a few hours as I knew its pleasant and helpful staff was re-stocking shelves every so often with new treasures. Coolstuff’s best offerings this year were from the library of Multi-Man Publishing, one of the groggiest of all grog-serving publishers. I picked up a brand-new copy of ASLSK#1 (I will not translate this for you) as well as A Victory Denied. I also saw copies of Guderian’s Blitzkrieg II, Where Eagles Dare, the ASL Rulebook, and several ASL modules — all at discounts that started good and got positively steep by Saturday. 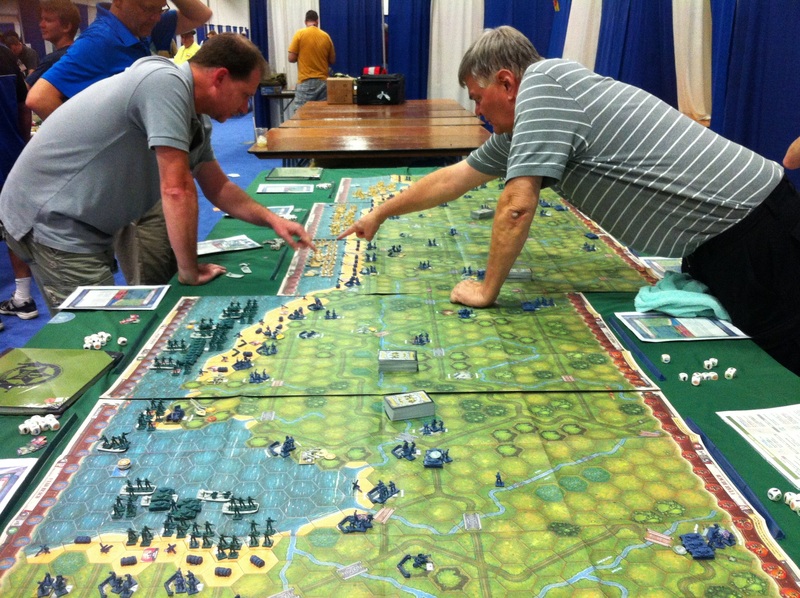 For those of us who can still smell the gunpowder and hear the trumpets, the wargaming portion of the Gen Con auction (12-2 p.m. on Friday this year) cannot be missed. Here is one of the only true determiners of how much that ancient, mint copy of Tactics II your dad left you is worth. People are starting to get the hint that their squooshed copy of Alexander the Great by Avalon Hill isn’t worth that much even though Gary Gygax helped design it, but there were items there — a good quality copy of the SPI Thirty Years’ War quad comes to mind — that still sold for a fair amount of money. Since its days in Milwaukee, the auction has been staffed by a dedicated group of guys that really know the history of games and will take you into corners of the hobby you didn’t even know were there. *Not* a couple of wargamers. That we could tell, anyway. And, yes, in the midst of a miniatures hall dominated by Warmachine and Battletech, there were historical games. For those playing along at home, Dawn Patrol was played. Again. By the same group that’s been doing it since Gen Con began. Flames of War had a handful of options, Bolt Action was diminished from the past few years but present, and I even caught a game of Jagdpanzer on offer. My wife, using the pretty slick convention database, tells me that there were more than 150 games from all systems in the category. Not too terrible until you realize that the total number of events runs north of 5,000. Sort of like the pin said, I found the historical gaming at Gen Con. I’m glad it’s still there.